three kids, two days, one dad. No reason to eat rubbish. I’ve been wanting to do this for some time – ever since Balazs cooked it for us in a pot hanging over a fire in his Budapest garden. If you’ve never heard of csipetke, they are the little dumplings that you serve with the goulash and they’re exactly like the spaetzle that you find in the south of Germany (although I’m not sure that’s going to help you a great deal). If you don’t have the will to try making them (and shame on you if you don’t) you can always use a small pasta instead. In the meantime, take a bowl and add about 100g of flour, a beaten egg, a pinch of salt and enough water to make a very thick batter. Mix it well, cover it and throw it in the fridge until you’re about 20 mins from serving the meal. 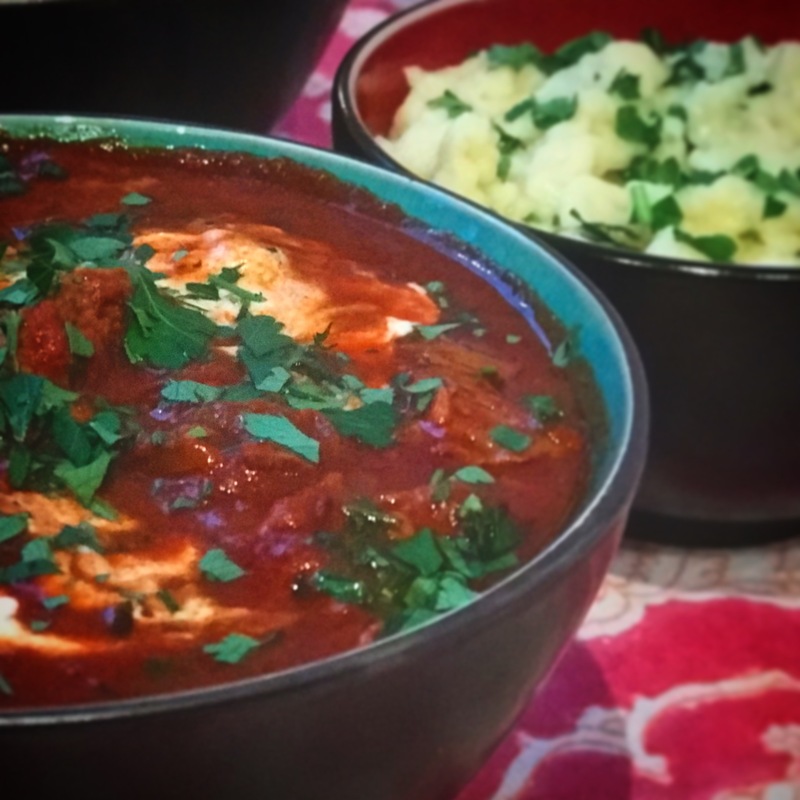 After a few hours, and when your beef is extremely tender, you can start to pull it all together – the goulash should be quite soupy at this point (add more water if it isn’t). Season it to taste with salt and pepper. Take a pan of boiling salted water and if you have a csipetke or spaetzle machine, stick the dough batter through it into the boiling water. If you don’t (like me), position a large holed grater over the top of the pan, and using a spatula, dump a large blob of the batter on top of the grater and push it through to create little blobs of dough which will solidify as they hit the water. Repeat until you’ve used all of the batter. The csipetke will not be evenly shaped at all, but that’s ok. Let them boil in the water for about 20 mins, drain, add butter and chopped parsley and you’re ready to go. This entry was posted in Meaty on October 22, 2017 by Jonny Kaldor.